Josh, I can't thank you enough for taking the time to put all this excellent material together. I feel a little jerky for pointing out somethings that could be improved, since you deserve kudos more than you deserve crits. 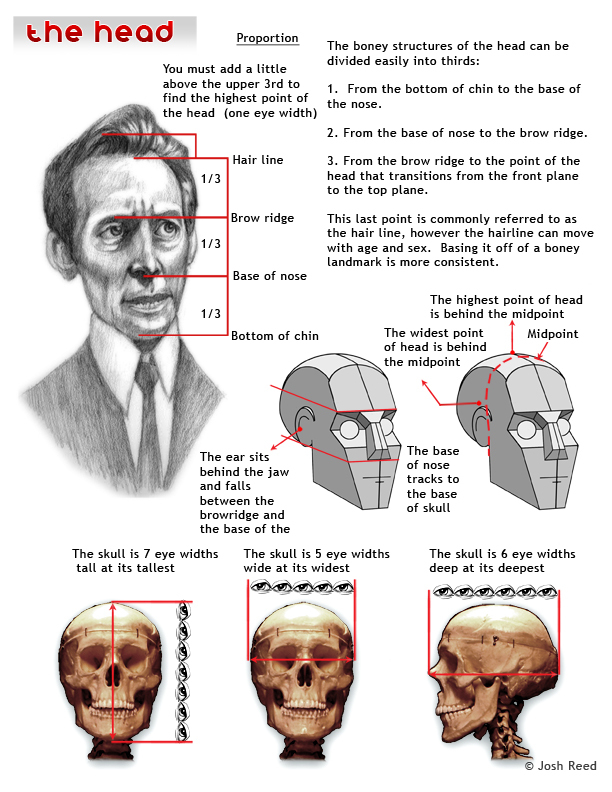 There is a small issue with the head diagram that you've posted here, and maybe I just not reading it right. The lines that run at the base of the chin, the bottom of the nose and the at the brow are all perfectly straight and perfectly parallel. But the centerline that runs up from the chin, and the points of contact for the outside edges of the nostrils are NOT centered. Maybe this is intentional and is supposed to indicate that the muzzle is not flat... but the parallel lines make that hard to read. Anyway - it's a small thing, ha ha, and you would never guess it by looking at my sketches, but I'm a stickler for nice construction. Thank you for pointing that out Scott, I have uploaded a revised version where I have fixed the error. Enjoy!